An SEI and Earth Track study finds that at $50 per barrel, roughly the current oil price, federal and state incentives are decisive in the economic viability of 45% of new crude oil resources. U.S. oil and gas production has risen dramatically in the past 10 years, driven by the rapid growth of hydraulic fracturing and horizontal drilling technology. The United States now produces as much crude oil as it ever has – over 3.4 billion barrels in 2015 – and is the world’s No. 1 oil and gas producer. But that boom has not come cheap. Federal tax subsidies alone have supported producers by billions of dollars per year. Including the broader range of federal and state subsidies that many firms receive, others have estimated total support to U.S. oil and gas production at about 18 billion USD per year. A new study by SEI with Earth Track evaluates the impact of these subsidies at the field level, estimating they could shift about 20 billion barrels’ worth of still-undeveloped oil reserves from unprofitable to profitable (at 50 USD per barrel, roughly the current price). Once burned, that oil would emit about 8 billion metric tons (Gt) of carbon dioxide – about 1% of the world’s remaining carbon budget if we are to meet the Paris Agreement’s 2°C target. Investors typically expect at least a 10% return. The study finds that subsidies – including the federal expensing of intangible drilling costs (IDCs), percentage depletion allowance, and the manufacturing (“199”) deduction, as well as uncompensated road maintenance costs at the state level – boost the return of most oil projects by 2–6 percentage points (median value of 3 points). The impacts on specific fields can be much larger. Looking at the 800+ fields that have been discovered but are not yet producing in the U.S., the study finds that at 50 USD per barrel, 45% of the overall resource, including 40% in the Permian Basin in Texas, 59% in the Williston Basin in North Dakota, and 73% of offshore, federally administered fields in the Gulf of Mexico is only profitable with subsidies (see figure, PNG, 120kb). At higher oil prices, the share of new production dependent on subsidies declines. Yet because both investment costs and key subsidies are concentrated at the start of oil and gas projects, the support available today could play an outsize role in determining production for many more years, regardless of future price trends. Subsidies also increase oil industry profits. At 50 USD per barrel, 53% of subsidy value (in net present value terms) goes to projects that would be profitable even without subsidies. At higher prices, nearly all of the subsidies flow to investor profits for activity that would have happened anyway. 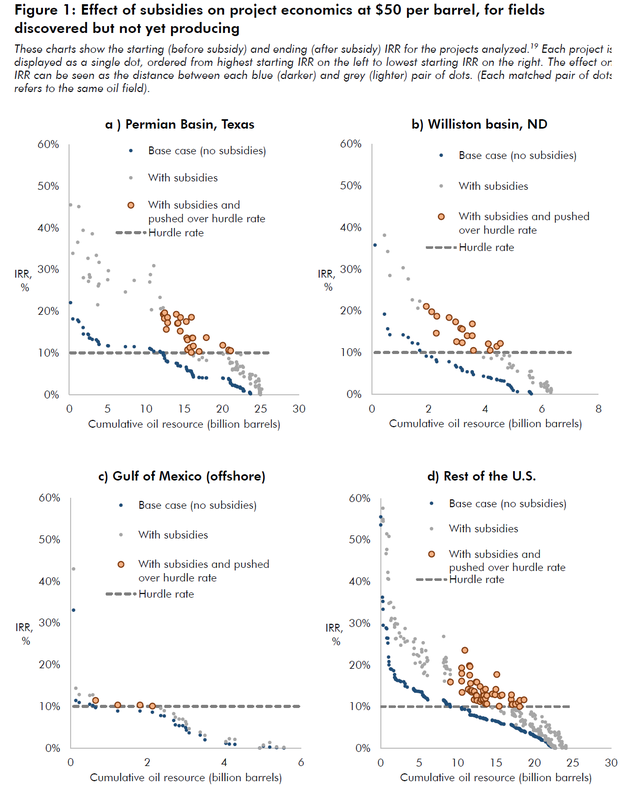 Subsidized domestic production may be offset in part by reductions abroad, but not fully. Even with production shifts elsewhere partially compensating, the authors estimate that domestic subsidies could lead to a cumulative net increase in global CO2 emissions from oil consumption of 1.5–5.4 Gt CO2. The range reflects uncertainty about the extent to which other countries will reduce producer subsidies and seek to align their oil production with the Paris Agreement commitments. Reduce inefficient and wasteful spending, freeing up public resources for other needs. At 50 USD per barrel, half of subsidy value goes to projects that would have proceeded anyway, a proportion that rises substantially with higher oil prices. This excess industry profit could be put to better uses. Demonstrate compliance with G20 commitments to eliminate inefficient fossil fuel subsidies and with Paris commitments to keep global warming to well below 2°C, and send a signal to other world leaders that the transition away from fossil fuels is well under way. Have a substantial impact on CO2 emissions, leaving an estimated 8 billion tonnes CO2 worth of oil undeveloped at prices near $50 per barrel. This shift would also reduce global CO2 emissions, as economic models indicate that other producers would only make up a portion of the avoided U.S. production, so the benefits to the climate would be significant.